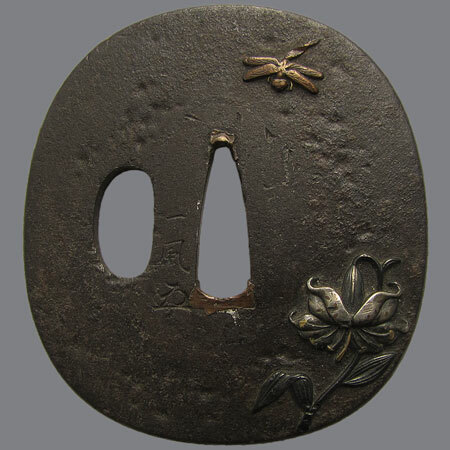 Iron tsuba with inlaid lily flower (uri) and dragonfly (tombo). 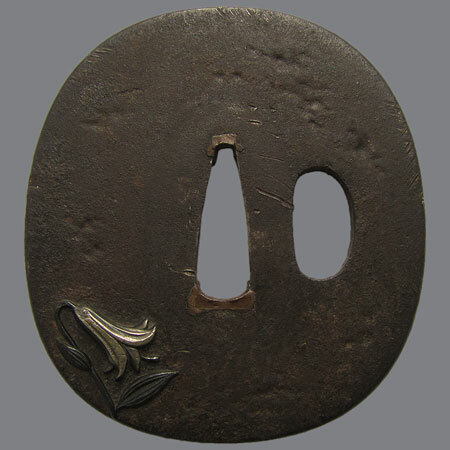 Tsuba become sligtly thicker to the edge - nakabiku. The lily was valued not only for its beauty in Japan. This plant was also cultivated as a vegetable: its bulbs are edible. In samurai culture the dragonfly called kachi-mushi, what literally means, “the bug that wins” or more commonly “Victory insect”. It is revered historically as an insect that only flies forward and does not retreat. The author of this tsuba - Ichifu. His family name was Fujii, and he worked in Aizu and Kofu about 1800. It is considered that his teacher was Shoami Masamitsu - one of the best artist of Aizu Shoami school. 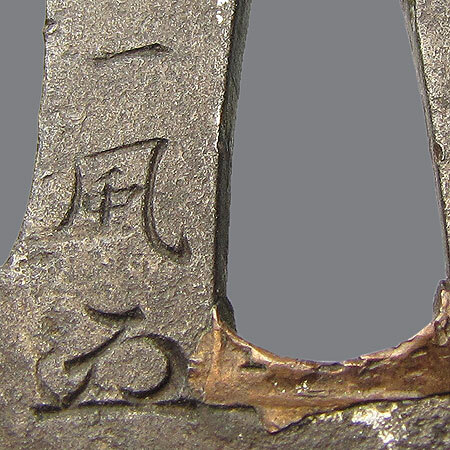 Inscription: 一風 (Ichifu) and kao. Aizu Shoami school. Age - Edo. Iron, tsuchime, iroe zogan with copper, silver and Shakudo. Kakumaru gata, kaku mimi koniku; 6,9 х 6,2 x 0,3-0,4 cm.